Next week’s webinar features Joel Bezaire who will share how he helps students see mathematics outside of the classroom. You can get more info on the session and register here. Twitter chats have been an amazing resource for the online math ed community. 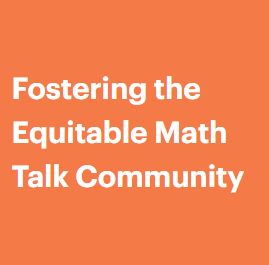 They’ve allowed math educators worldwide to engage in a wide range of focused, public conversations, where anyone is welcome to join. Two recent chats come to mind as representing some of the best that the Twitter platform has to offer: #ClearTheAir and #SWDMathChat. And I must say, the chat was . Some people have been contributing to #ClearTheAir even after the last question was asked Wednesday night, so I strongly encourage reading people’s thoughts and contributions if you haven’t already done so. There’s a lot to process, but here’s just a sample of what went down. Shout out to Christie Nold! The theme for this most recent chat was “What is Possible?” Participants discussed what was possible for engaging students with disabilities in mathematical thinking and reasoning. The common denominator denounced, rightly so, the isolation that can occur when special education students are physically, intellectually, and/or socially isolated from their gen ed peers, especially in math class. @ScottGeisler12, @Julie12129030, and many others participated in last week’s chat. I’ll close with a short list of books that I’ve read or are next up on my reading list in addition to “White Rage”. Such books highlight the multi-faceted, political nature of the work we do as educators. The Color of Law: A Forgotten History of How Our Government Segregated America, by Richard Rothstein. 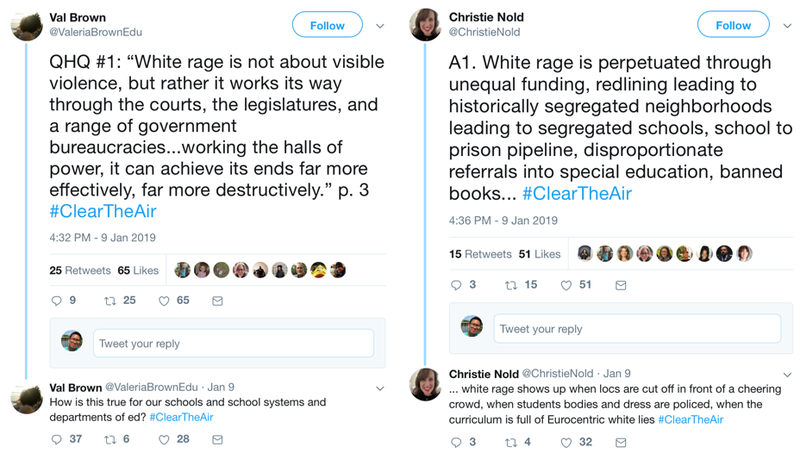 Like Melvin, the book “White Rage” by Carol Anderson is on my mind. The book details the extent and depths and insidiousness of white rage, from “Reconstruction”, all the way through to voter suppression. Some sections will make you want to throw up (either from intense violence described, or from a “how can this even be real?” feeling). Some brief notes about 1957, “Sputnik”, and Brown vs. Board of Education. Many of us are often scolded for tweeting about things other than mathematics, as if we have no humanity, no interests, outside of our jobs as eduators. Many who come from more conservative perspectives, both about the world and about mathematics, suggest that it can and must be “neutral”. Some things are about mathematics are neutral, like the square root of any number, or counting to 100. Sure, fine. But the systems that mathematics are embedded in have their own axioms and their own beliefs that become encoded in what mathematics is taught, and how. There was a school district in Virginia that closed all schools for 5 years, rather than let black students in. This is called “cutting off your nose to spite your face”, and yes, the powers that be were willing to close the schools even to the poor whites who might have needed them, rather than let blacks in (the rich, presumably, had their own schools). So forget Sputnik, forget “back to basics”, and forget about mathematics as “neutral”: many students weren’t even allowed in to learn the basics. Are we feeling “neutral”, yet? Not after reading this book, I am not. I would add to Melvin’s list above of books for the #ClearTheAir shelf, Ijeome Oluo’s So You Want To Talk About Race.